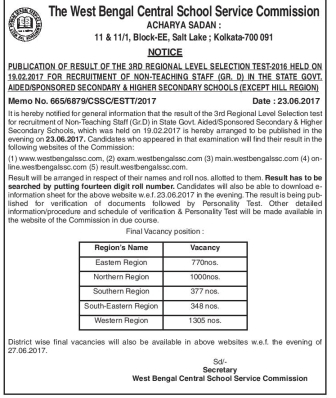 West Bengal School Service Commission (WBSSC) published on 23rd June, 2017 the result of Gr-D (3rd RLST) 2016 exam. The written exam was held in February-March 2017. Today, the commission has released the Region-wise vacancy details of Gr-D (3rd RLST) exam. Check further for more details about region-wise vacancy. The district-wise vacancy details for Gr-D (3rd RLST) post will be made available on 27.06.2017. We will publish on our website about it. The schedule of document verification and interview will be available in due course. We will intimate the details when it will be published. 0 comments for " WBSSC Gr D (3rd RLST) 2016 Region wise Vacancy "